The holidays are over (yes, depressing), and even though we are only half way through Semester 1, as a club we already have several key events done and dusted. In March, we had our annual Grand Launch, held in the Undercroft. It was a wonderful evening – from our speaker Glenn Martin, to our two-piece entertainment for the night, Sanscribe. We were all glad to meet share a drink with our members and it was great to see so many people enjoying themselves. Our other main focus has been on our famous Napkin Challenge. 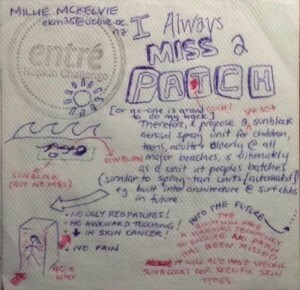 The competition where we ask entrants to draw an idea on a plain napkin received over 200 entries and it was great to see such a wide range of ideas. From building a flying fox from James Hight to Matariki, to the eventual overall winner, we were blown away by all the entries and we want to thank all the students who took part and entered. Entries for the 85K challenge close tomorrow (4 May)! This all leads up to our main competition: the 85K Challenge. Our main competition has been well underway for several weeks now and entries close on 4 May at 5pm. We are encouraging all students to get involved and enter because there is so much to be taken from it and great fun to be had as well. Entries can come either as a single or in a group, either way, we can’t wait for the plethora of ideas. For more information, head to our Facebook page, ‘Entré Canterbury’, or straight to our website. The entré Napkin Challenge has wrapped up for this year and the winners have been chosen! For those that don’t know, entré is a student-run company at UC and CPIT that inspires students to excel in the business world. The Napkin Challenge is an easy competition that requires students to simply think of an idea and jot it down on a napkin. This year, the judging panel consisted of Rachel Wright (UC Innovators), Sarah Platt (UCSA President) and Juan Pellegrino (CPIT Business School). Congratulations to the overall winner, Millie McKelvie, with her napkin titled I Always Miss a Patch, where she came up with the idea of a spraying booth to make sure you get sunblock all over without missing anywhere. Millie won an iPad Air and a cake from the amazing Cakes by Anna. Next up on the entré agenda is the massive $85K Challenge, the most prestigious event on their calendar. The competition offers entrants the chance to develop key business and presentation skills while refining their idea into a viable business over the course of the year. This year the Apps Challenge has been merged with the $85K Challenge, so now your innovative ideas for apps can have the chance to be developed into real business ventures too. ENTRIES ARE NOW OPEN! Submit an entry online explaining the basics of your business idea. All entrants will attend an exclusive design-thinking workshop with prizes up for grabs. Entries close on May 1st at 5pm. Make sure you follow entré on Facebook and check out the website for more details and to keep up to date with all of their events, including free business workshops! 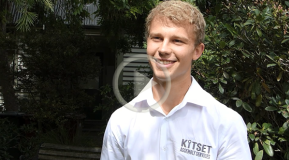 Jorgen Ellis has triumphed with his company Kitset Assembly Services before he’s even finished his commerce degree at the University of Canterbury. Having worked in a home improvement store, Jorgen was constantly asked by customers if they offered a service to assemble their purchases. After hearing the request so frequently and repeatedly having to turn them down, Jorgen decided there was certainly a market for it and started up on his own. It’s a genius idea – nobody likes assembling things like furniture, shelves, office equipment or exercise equipment. Buying these things seems like such a good idea and then you get home and have to decipher instruction manuals and an overwhelming number of components – a headache for most people. Jorgen has capitalised on this, with his business offering assembly services for hundreds of items as well as delivery if required. Jorgen says there is a huge demand for assembly of one item in particular “It’s garden sheds. You know, Kiwis love their garden sheds, but they definitely hate putting them together”. The most peculiar item he’s been asked to assemble is a shoe rack “It only took about two minutes, so that was an unusual one”. Having been up and running for only 11 months, Kitset Assembly Services already employs three assembly specialists and has partnerships with retailers such as PlaceMakers, Freedom, Briscoes and Mitre 10, just to name a few. Currently based in Christchurch, Jorgen hopes to establish the business in Auckland in the next year. As managing director of the business, Jorgen is now a very busy guy. He still has one year of his commerce degree to go, but is currently taking the year off to focus on developing the business. Jorgen puts his success down to having drive and passion, as well as the expert help of UC Innovators and entré. As part of the UC Innovators Summer Start-Up Scholarship programme Jorgen received a $5000 scholarship as well as access to amazing business mentors. He also entered the entré $85k challenge, winning $5000 worth of business advisory services from PWC among other prizes. If you have an idea for a business like Jorgen did, his advice is simple, “Just do it, take every opportunity you get, you’ve got nothing to lose”.